The camera on the LG Optimus G is a 13MP unit and can snap photos with a maximum resolution of 4208 x 3120. It can record FullHD videos too. The interface is more or less the same as what we saw on the Optimus 4X. You get a column on the right with the still/video toggle, a virtual shutter key and gallery shortcut on the right and a column with five shortcuts on the left. You can edit the top four of these shortcuts so you can have one-tap access to the features you use most. By default, the top shortcut toggles between the front and back cameras, the second activates the "cheese shutter" (which lets you snap a photo by saying "Cheese! ", "LG" or a few other words), the Time catch shot (we'll get to it in a moment), shooting mode and the settings shortcut. You can pick between one of four shooting modes - Normal, HDR, Panorama and Continuous shot. The Time catch shot feature (also called Time machine camera) does something pretty unique - it snaps a photo, but also records several photos of what happened before you hit the shutter key. You can save any of the photos on that list that you like. This way, even if you missed the moment, the LG Optimus G will have captured it. Anyway, here are several camera samples we shot with the 13MP camera on the LG Optimus G.
The video camera can record 1080p videos at 30fps. Live effects let you do real-time effects (that is, ones that are visible in the viewfinder as you shoot the video, not ones applied during post-processing). You can either use funny face effects (with automatic face detection) or do a sort-of green-screen effect by replacing the static background of the video with something more exciting (this works best with a tripod as shaking the camera causes the whole image to change). Check out this FullHD video sample from the Optimus G.
We're quite happy with the build and finish of the LG Optimus G and, even though all that glass wouldn't have been our top choice, LG had legitimate reasons to use it instead of metal. The screen is very good (as we've come to expect from LG) and the 13MP camera gives the Optimus G an edge over most flagships, but we'll need more detailed testing to determine if it's just an advantage in numbers or in quality too. 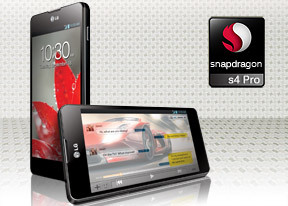 As for the Snapdragon S4 Pro chipset, it's certainly showing a lot of potential. It's more powerful than any other mobile chipset currently in use (including those in the Windows 8 RT tablets), but it did show a tendency to overheat. We hope this is just an issue with the pre-release unit we tested. The extra computing muscle allowed LG to include some eye-catching software tricks, but there are no major updates, most of the software on the Optimus G we've seen on the 4X HD and Vu. Still, at the end of the day the LG Optimus G E973 is the first phone (first to hit the market anyway) that abandons old processor and GPU designs and moves to next-gen silicon. We are now hoping it abandons ICS and moves to Jelly Bean as quickly as possible - that's the only thing preventing the Optimus G from providing the best possible user experience on Android.